I told my dad that I had recommended some croissants on DessertBuzz and suggested that he help me with an update to the review. He seemed mildly interested but I wasn’t sure if he was ready to give up his routine on the off chance that he might find a better almond croissant somewhere else. Could I get him to at least try Cesi Cela? 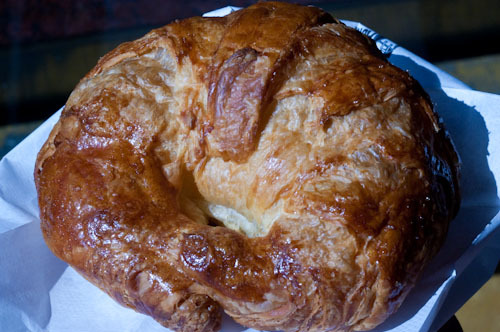 Some have said that beyond their delicious, slightly burnt crust, La Bergamote’s almond croissants are soggy. I disagree with this view. The two that I tried over the last three weeks were not soggy or wet in any way. They were some of the flattest high-end croissants I have seen in NYC–so if a flat croissant is going to upset you, you should avoid these. 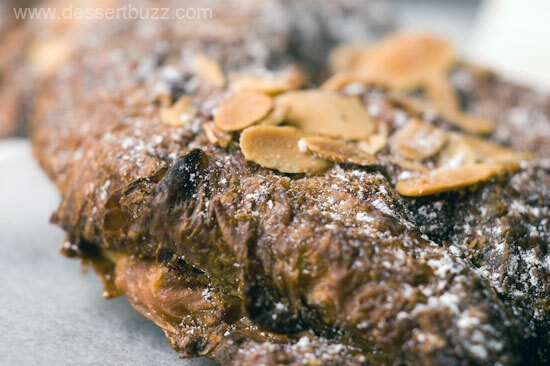 However, they also seem to have a metric ton of almond flavor–especially the roasted, slivered almonds on the outside. A note about La Bergamote’s savory options: In addition to the pastry items I had a really excellent tuna nicoise salad. It was fresh and had a plentiful amount of tuna. La Bergamote is located at 177 9th Ave (20th St.) They also have a location at 515 West 52nd. Their website is here.